Campagnolo calliper mounting bolts. BB info. Post subject: Campagnolo calliper mounting bolts. BB info. Hi, does anyone know if mounting bolts for record and monoplaner are compatible? 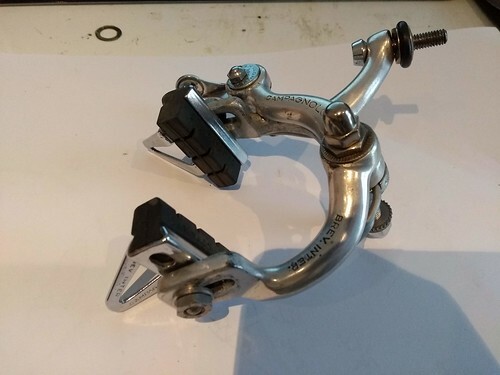 I have a pair of record callipers with 'incorrect' frame mounting bolts ( just a threaded bar ) and am looking for spares to convert to allen recessed frame fitting. Also am I correct in assuming that BB spindle 113 mm with world logo takes 1/4" bearings if steel and 3/16" if Ti ? I don't think the monoplanar bolt is compatible. And you want to convert them from bolt on to recessed, then that's quite easy. You use the back bolt-on brake on the front - the bolt is about the same length as the recessed front one. Make sure you swap the brake blocks to the other side so they don't slide out. Pretty sure your BB assumption is correct, but I don't have a ti one to check. Brilliant thanks, I have a back nos to swap, so I’ll get the other Mercian... some proper dome nuts would be nice!